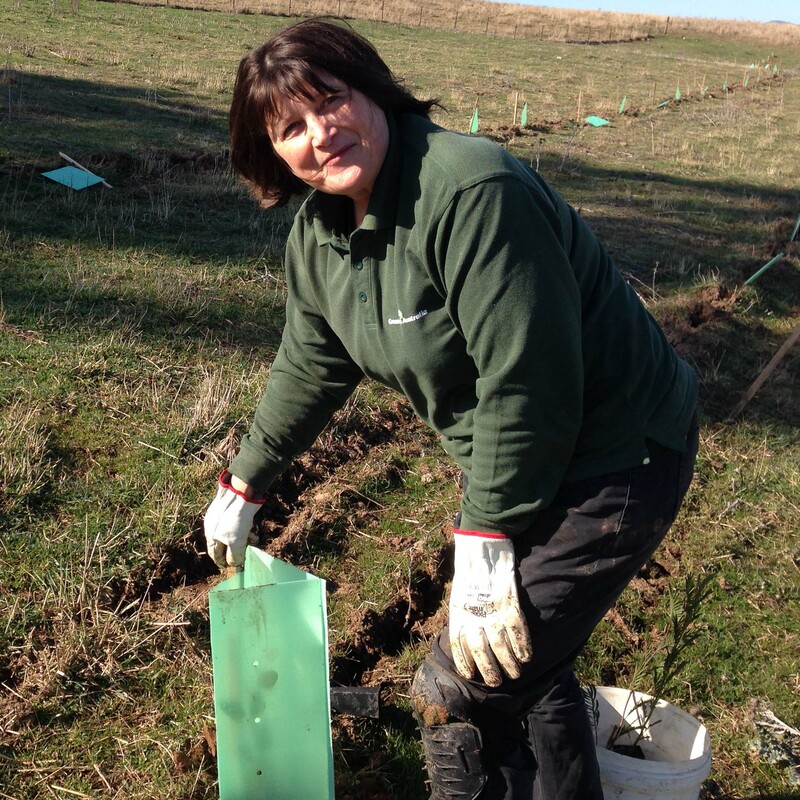 Tree planting doesn’t always go as planned. 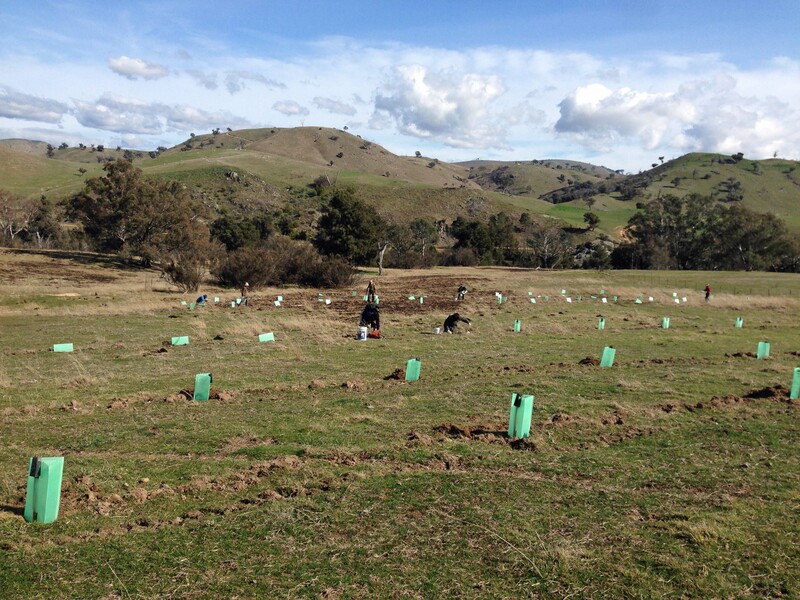 In 2011, before we actually moved back to Australia, I spoke to Graham Fifield at Greening Australia about being part of their WOPR (Whole Paddock Rehabilitation) program. That program is designed to revegetate an area of 10 hectares or more, using bands of trees and shrubs directly seeded on the contours. 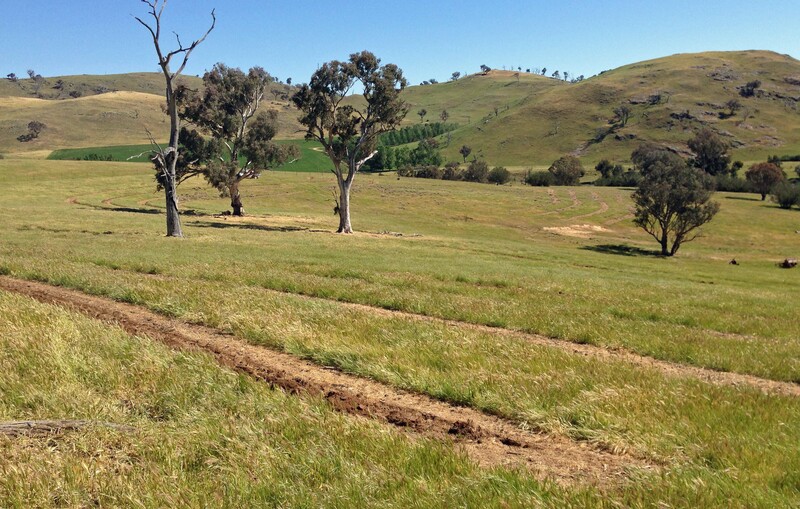 It uses existing paddocks, so doesn’t require the extra fencing that most tree-planting needs. After five years, the grazing animals are allowed back in, so it’s not taken out of production permanently. I was interested in trying direct seeding, partly because the way I plant tube-stock trees (with deep drilled holes, plastic covers, mulch, heavy watering, fertilizer, more mulch) is pretty labour-intensive. 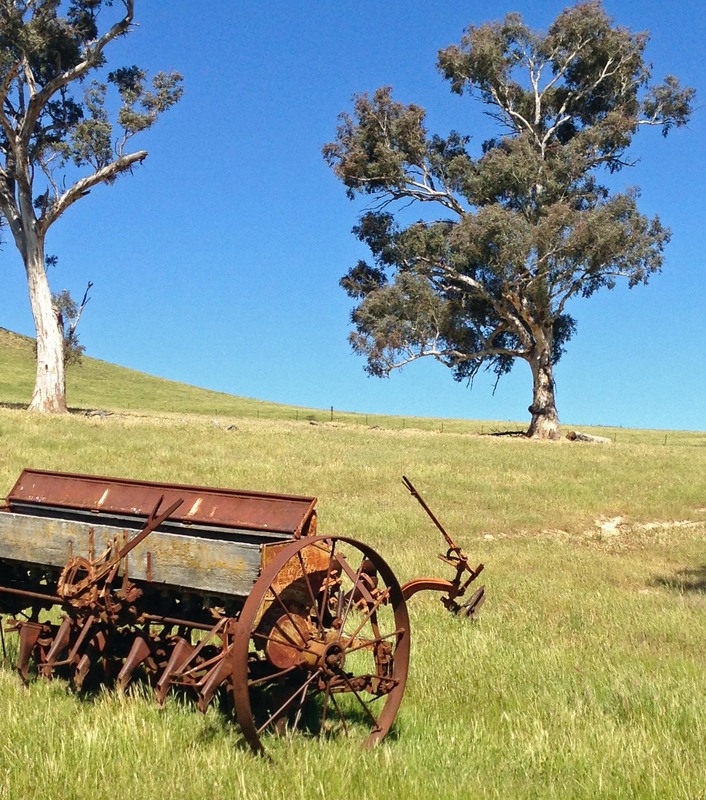 If seeding worked, it could be an easy way out. I was feeling a little overwhelmed at the (643 hectare) size of the entire farm rehabilitation project, so doing 10 hectares at once seemed like it would be a big step forward. I counted my tree seedlings in the thousands well before they were germinated. 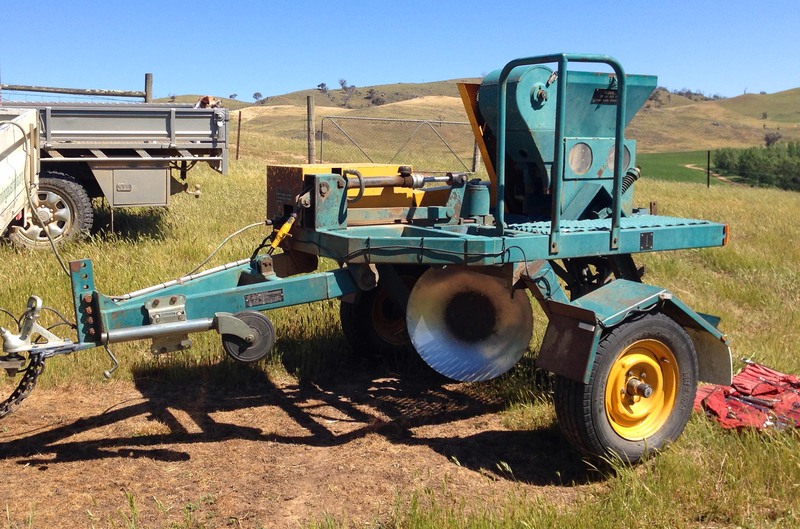 I hoped that the benefits of planting wattles (acacias) for sheep browsing would help persuade Frank Kaveney, who’s using it for grazing, that the revegetation was a good idea. Research has shown for example that chewing on wattle foliage helps protect against certain types of worms. I argued that the ripping on the contour would take care of that – because everything is at one level, there’s no way for the seeds to wash down. That’s the theory. Graham and I drove around Adnamira with Frank looking for the right space that could be direct seeded. Most of our country is too steep and too rocky for machinery. Tractors will either tip over or snag on unseen boulders and destroy any mechanical attachments. We finally settled on a paddock that was the site of many childhood picnics, because it includes a beautiful river beach, and a rocky island. Dad ploughed up the paddock using the old horse-drawn equipment that came with the farm, tricky to do when you’re on a tractor. The equipment is still sitting around, because it’s too heavy to move. Unfortunately, while the spraying and seeding went well, in October 2012, the seeds didn’t strike. They certainly weren’t thick as hairs on a cat’s back. While I looked enviously at other people’s direct seeding results, when I crawled along our seeding rows I couldn’t see much. Frank said he saw a couple of wattle seedlings, but I never caught sight of them. “Direct seeding never works” he added. Rampant African lovegrass and no sign of tree seedlings. The weeds however came up thickly along the sprayed lines, so that the easiest way to find the lines was to see the green of the thistles. The fierce heat waves of December and January 2013 were brutal for plants anywhere. Instead of mentally counting my new (imaginary) trees, I started averting my eyes when I drove past on the way home. “Direct seeding never works,” Frank pointed out. We watched through the spring of 2013 and saw nothing but more weeds. 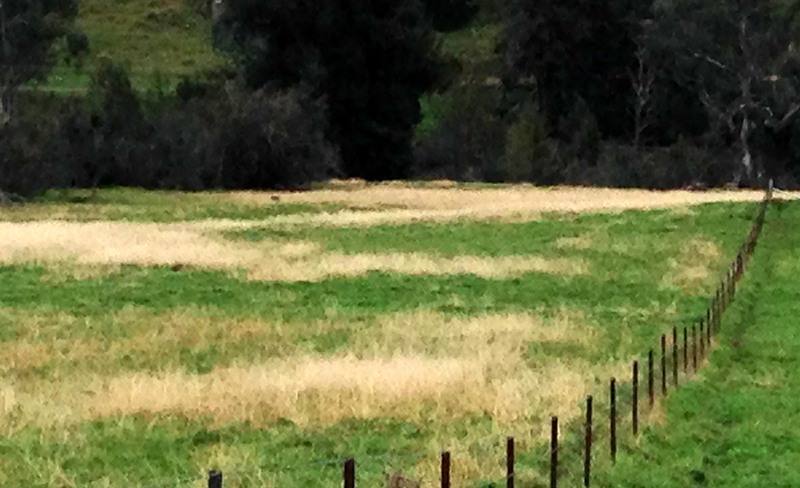 The African Lovegrass continued to spread. Then the existing trees threatened to ruin the whole project. One old red gum had been used as a strainer post for a corner of the fence near the river. Dead for many years, and with its roots in the sandy soil undermined by wombats, it decided to collapse in 2014, taking a long stretch of fence with it that was hidden by the casuarinas. 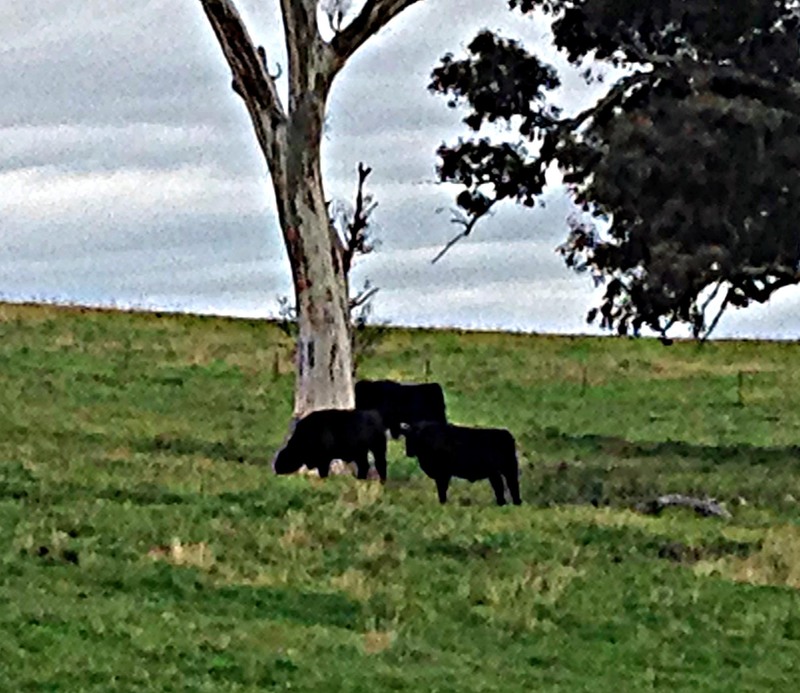 Suddenly Frank’s cattle were grazing happily on my imaginary seedlings. It took me a while to figure out what was going on, and to barricade them out. The steers were pretty determined to come back in again, and succeeded three times. In March 2015 a branch fell on the top fence, and let some sheep in. Around the same time our neighbour Richard Scanes started to see signs of pigs digging along the river banks. So far he’s killed seven, but there are still more around by the look of the markings. The African Lovegrass (an invasive weed) was spreading enthusiastically, but I couldn’t burn and spray it because of the imaginary seedlings. Miraculously, things were getting back on track. We got the fence fixed. The cattle had been converted into beef steaks. Richard was doing a great job with the pig removal. With only a week to go before the planting, we burned off the dry stalks of the African lovegrass so that any seeds will germinate, and we can spray that and any green growth in the early summer. I got to use my new drip torch, plus one we borrowed from Frank. 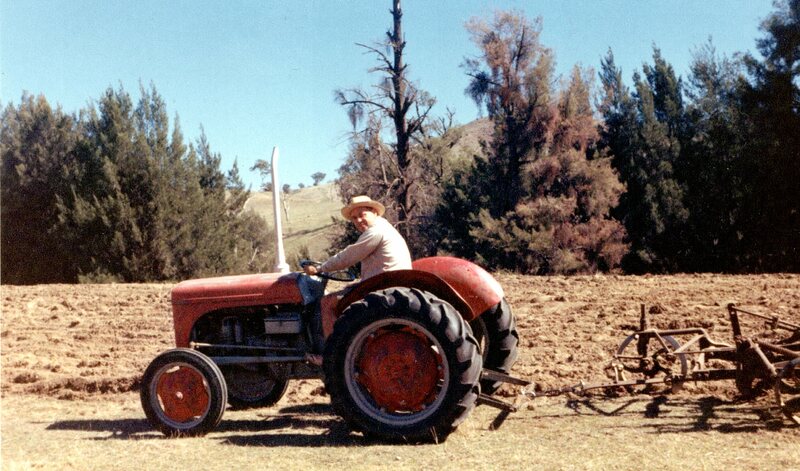 Frank wasn’t going to let me loose with his tractor to make riplines, however, “It’s too easy to break the three-point linkage by letting it dig too deep. It needs experience,” he explained. After some searching about, I found a tractor driver with a ripper to drag 400 mm deep lines next to the existing seedling lines. The soil in the rip line still had to be modified by the planters to put the seedlings in, but it was quick and effective, all done in one morning. Suddenly things started to go well. There was just enough rain before the ripping to make the ground soft, but not to swallow up the tractor in a bog hole. And the ground was still nice and damp for the planting three days later. The weather was chilly but not actually bleak when the Green Team arrived on July 30th. With great efficiency they loaded up with plants and covers and moved across the contour lines, planting as they went, despite what Graham called “all those titanium body parts”. Some people I chatted to while we were planting turned out to be retired local farmers, who find the Green Team a great way to get out of town again. They found the nice fresh riplines easy to plant “Unlike some others we’ve done”. As I’d seen previously, the watering system with buckets is harder on your back, but much more efficient with water than our running about with a dripping hose. Everything got done in time for a pleasant picnic in the shelter of the tea-trees. It wasn’t possible to do all 800 trees and shrubs in one morning, but three Green Team members came back on another day to do another 200, making 700 approximately. Yay! These trees are real, not just imaginary. Much more satisfactory. Tree planting doesn’t always go as planned. But if you keep at it, you get something good in the end.